Saturday, June 23, 1888 still pleasant & warm, tho' no warmer certain. All moving on much same with our folks, & of course busy as ever. Ellery having Boy in "book store", spent more time than usual at work in garden. Hardly "well as usual yet self, but better & at usual chores with knitting & repairing, spending time in chamber, till she that was "Lena Sanderson" was in last P.M. when Ch- called me. Sunday 24 Weather remains about the same. 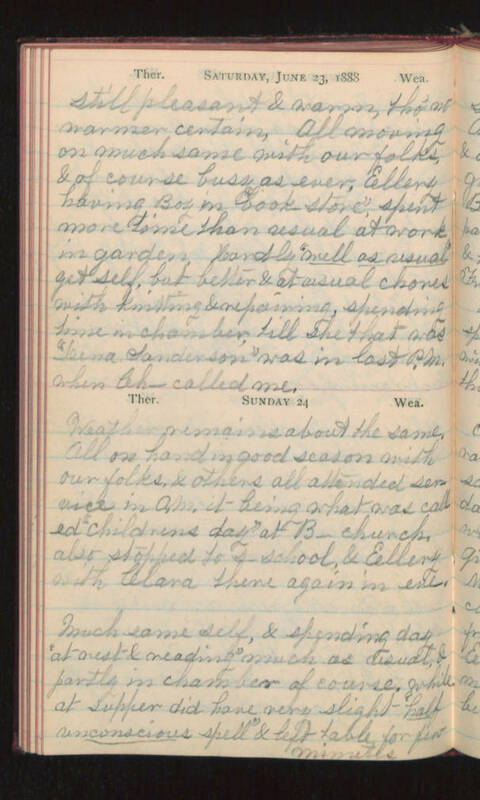 All on hand in good season with our folks & others all attended service in A.M. it being what was called "childrens day" at B- church, also stopped to s-school, & Ellery with Clara there again in eve. Much same self, & spending day "at rest & reading" much as usual, & partly in chamber of course. While at supper did have very slight "half unconscious spell" & left table for few minutes.